I was taken by Whisperers at 2pm, so I never pulled the lever for the laundry chute. That’s what bothered me most. This is way ahead in the story, though. A lot happened before that. The town of Spindrift is frequented by pirates, Shadow Mages and charlatans. It’s also home to the Orphanage School, where Finlay lives with Glim, Taya and Eli. Just outside town is the painfully posh Brathelthwaite Boarding School, home to Honey Bee, Hamish and Victor, Duke of Ainsley. When the two schools compete at the Spindrift Tournament, stakes are high, tensions are higher, and some people are out to win at any cost. Before long, the orphans and the boarding school are in an all-out war. And then Whispering Wars break out, and Spindrift is thrust onto the front lines. Children are being stolen, Witches, Sirens and a deadly magical flu invade the town, and all attempts to fight back are met with defeat. Finlay, Honey Bee and their friends must join forces to outwit the encroaching forces of darkness, rescue the stolen children, and turn the tide of the war. But how can one bickering troupe outwit the insidious power of the Whisperers? And who are the two mysterious figures watching them from the shadows? Not since Jaclyn Moriarty’s last book have I been so immersed in a wickedly adventurous story brimming with quirky characters, bravado and irreverent humour. 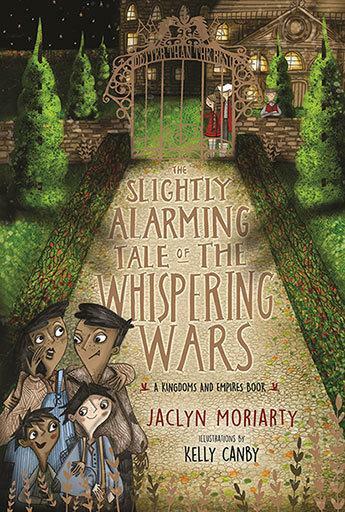 The Slightly Alarming Tale of the Whispering Wars is set in the busy harbour town of Spindrift, a wonderful ‘stir fry’ of fascinating characters from surrounding kingdoms and empires – including witches, gnomes and sirens who’ve agreed to stop using magic in order to live harmoniously among the regular townsfolk. The story is narrated by the irreverent Finlay (from the orphanage school) and the rather shy Honey Bee (from the posh and somewhat pompous boarding school). Furious competition between their schools produces an outcome that has each concocting outlandish schemes to punish the other. But when malevolent characters secretly invade the town, a deadly magical flu infects the population, and children are stolen, war between the kingdoms is imminent. Fiercely determined to find their kidnapped friends, an unlikely alliance between the schools is forged. Finlay, Honey Bee and their friends hatch a plan to outwit the sinister invaders. Set fifteen years before The Extremely Inconvenient Adventures of Bronte Mettlestone, this stand-alone tale of whimsy and irony is a pure delight, and a solid read perfect for voracious readers. Highly recommended for ages 10+. A new novel about belonging, loss and love from the celebrated author of Star Jumps, the 2010 winner of the Prime Ministers Award for Children's Fiction.